The Jerusalem Post article titled - NY hassidic village loyal to Clinton despite Trump popularity among ultra-Orthodox quotes Ezra Friedlander on Jewish vote. 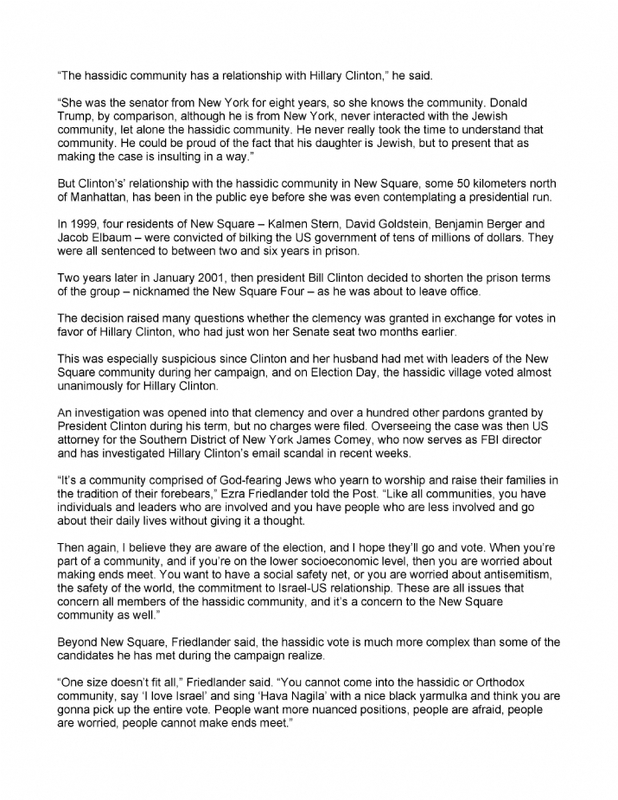 NEW YORK - Back in 2000, when she was running to represent New York in the Senate, Hillary Clinton benefited from the almost unanimous vote of one small Jewish hassidic village in Rockland County called New Square. This week, running for president, Clinton is once again expected to be the favorite of New Square - a town comprised mostly of Skver Hassidim - whose loyalty runs counter to the prevailing trend of the American Jewish community. While overall support among American Jews traditionally leans Democratic in presidential elections, polls have shown that when it comes to Orthodox voters, the tendency is reversed. 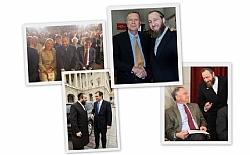 "The hassidic community has a relationship with Hillary Clinton," he said. "She was the senator from New York for eight years, so she knows the community. Donald Trump, by comparison, although he is from New York, never interacted with the Jewish community, let alone the hassidic community. He never really took the time to understand that community. He could be proud of the fact that his daughter is Jewish, but to present that as making the case is insulting in a way." But Clinton's' relationship with the hassidic community in New Square, some 50 kilometers north of Manhattan, has been in the public eye before she was even contemplating a presidential run. In 1999, four residents of New Square - Kalmen Stern, David Goldstein, Benjamin Berger and Jacob Elbaum - were convicted of bilking the US government of tens of millions of dollars. They were all sentenced to between two and six years in prison. Two years later in January 2001, then president Bill Clinton decided to shorten the prison terms of the group - nicknamed the New Square Four - as he was about to leave office. The decision raised many questions whether the clemency was granted in exchange for votes in favor of Hillary Clinton, who had just won her Senate seat two months earlier. 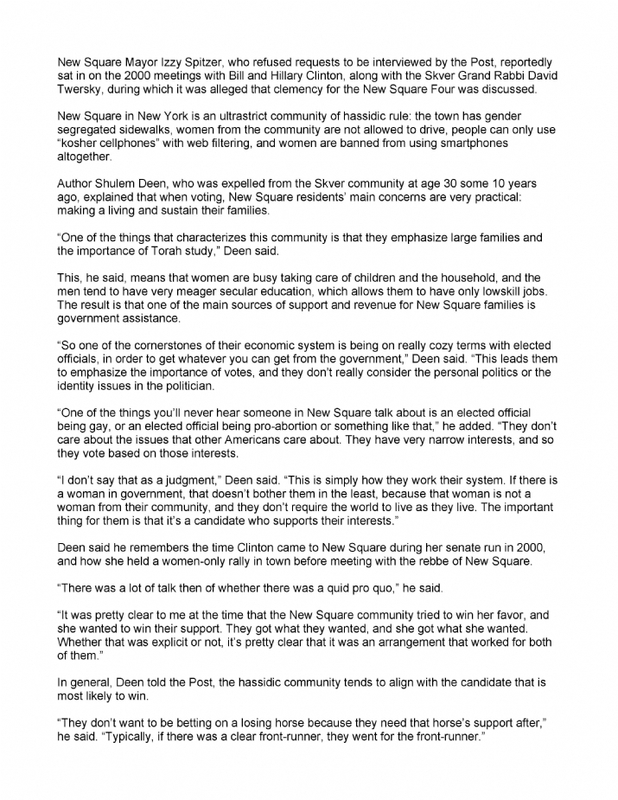 This was especially suspicious since Clinton and her husband had met with leaders of the New Square community during her campaign, and on Election Day, the hassidic village voted almost unanimously for Hillary Clinton. An investigation was opened into that clemency and over a hundred other pardons granted by President Clinton during his term, but no charges were filed. Overseeing the case was then US attorney for the Southern District of New York James Comey, who now serves as FBI director and has investigated Hillary Clinton's email scandal in recent weeks. "It's a community comprised of God-fearing Jews who yearn to worship and raise their families in the tradition of their forebears," Ezra Friedlander told the Post. "Like all communities, you have individuals and leaders who are involved and you have people who are less involved and go about their daily lives without giving it a thought. Then again, I believe they are aware of the election, and I hope they'll go and vote. When you're part of a community, and if you're on the lower socioeconomic level, then you are worried about making ends meet. You want to have a social safety net, or you are worried about antisemitism, the safety of the world, the commitment to Israel-US relationship. These are all issues that concern all members of the hassidic community, and it's a concern to the New Square community as well." Beyond New Square, Friedlander said, the hassidic vote is much more complex than some of the candidates he has met during the campaign realize. "One size doesn't fit all," Friedlander said. "You cannot come into the hassidic or Orthodox community, say 'I love Israel' and sing 'Hava Nagila' with a nice black yarmulka and think you are gonna pick up the entire vote. People want more nuanced positions, people are afraid, people are worried, people cannot make ends meet."